If you are experiencing problems with your broadband service you can try a factory reset to remove the current configuration from the device and restore the original settings. Please note that this will remove any customisations and changes that you have made to the router. 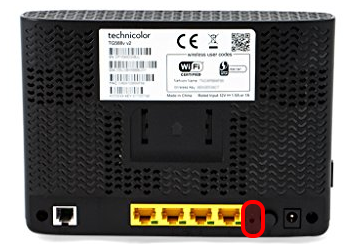 Whilst your router is turned on, carefully push a thin object into the reset hole on the rear of the unit until the power light turns off, then release the button. The unit will reboot and attempt to contact our servers to download its last known good configuration. This process can take up to five minutes, so please ensure that you leave the DSL lead connected between your router and the telephone socket during this time. When the broadband and internet lights are green the router is ready to use. If any of the lights turn red please contact our support team for further assistance.